Hope you all had great festival and long weekend. We had wonderful celebration of Vinayagar Chathurthi, am here posting recipes prepared for Lord Ganesha. Had invited few friends for lunch and went to Marina Bay Sands Skypark. 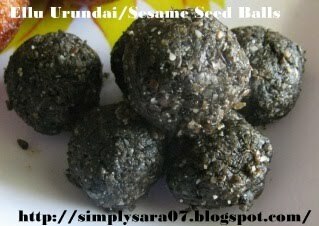 Ellu Urundai/Sesame Sweet Balls is prepared with Black Sesame Seeds and Jaggery. Black Sesame Seeds are used in traditional Chinese Medicine. Its also good source of calcium. Black sesame seeds also have high amounts of protein, phosphorous, iron and magnesium. This is a must offering for Lord Ganesha. Wash and rinse Karuppu Ellu/Black Sesame Seeds to remove the sand and dirt from it. Leave it in a strainer to remove all water for 5-10 mins. Dry roast in a Kadai/wok till you get good aroma and it starts spluttering. Off the stove and transfer it to a plate for cooling. Then in a mixie add Ellu/Sesame Seeds and wip once and then add jaggery and grind to fine powder. Make small balls. If you are not able to make balls add little more jaggery and grind. I made 11 nos. out of it. Enjoy the Ellu Urundai/Black Sesame Sweet Balls. my mom makes this during navaratri and we eat a lot and get scoldings from from her, as it generates heat if consumed more. A healthy and yummy treat!! i love them very much..urs sweet balls looks yummy..
My most favourite sweet balls, just love it..
ellu urundai was really gud saras....it was soft and perfect!! A new recipe to me. Looks so interesting and great.